If you’ve tasted Mezcal Real Minero, you know it’s special. It can be difficult to find due to their limited production and certain bottles retail for as much as $180 in the United States! While that is not cheap, in my experience their product is some of the finest. Others seem to agree.. as of this publishing date, Mezcal Real Minero Largo is the top-rated mezcal on Mezcal Reviews with five, 5-star reviews. If you’re like me, you have at least one of their bottles stashed away for special occasions with good friends. 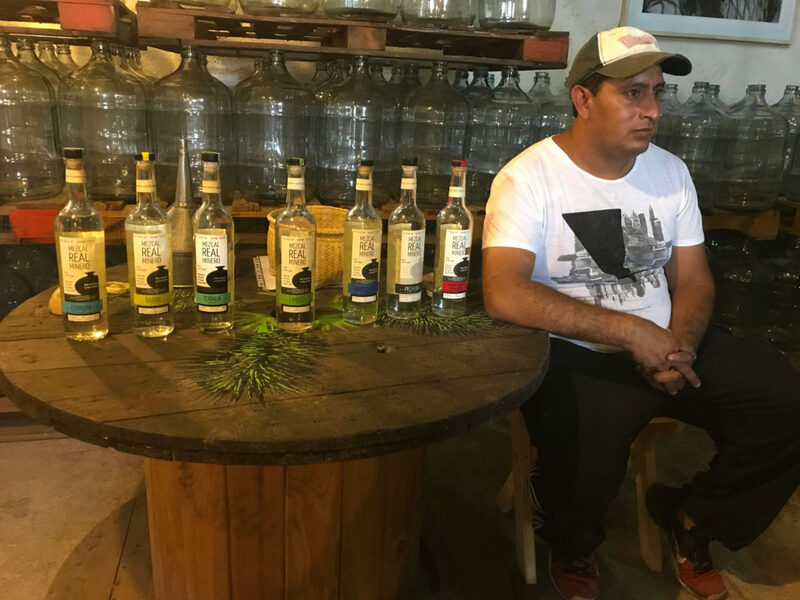 In May, we had the pleasure of visiting the Mezcal Real Minero palenque (distillery) in Santa Catarina Minas and seeing for ourselves how their process yields some of the world’s best mezcal. Minero, a colorless mezcal with agreeable flavor, is produced in Santa Caterina Minas, Ocotlan. Its name and fame may stem from the fact that only miners in the past, who were well paid, could afford to buy it. You might hear that Minero is just a term for mezcal from Santa Catarina Minas. A general classification like that makes sense as well. It’s interesting to note that most, if not all, of the mezcal from this region is distilled in clay pots and has been done this way for many years. 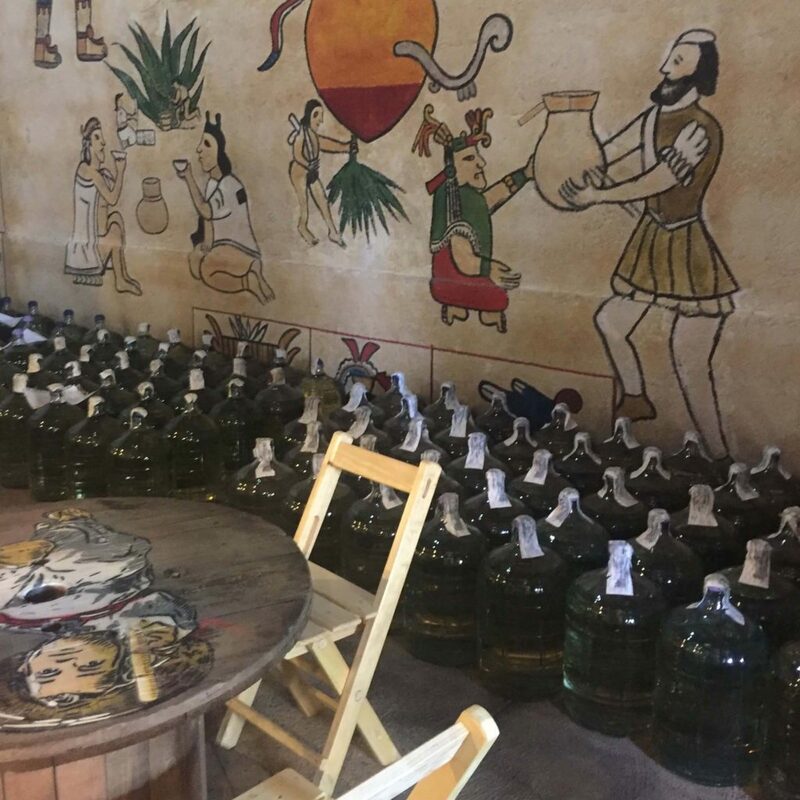 The Angeles family of Mezcal Real Minero is part of this history; they have been producing mezcal for generations and their mezcal was undoubtably some of the most “agreeable” mezcal consumed by the prosperous miners. 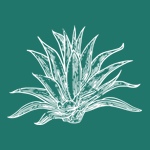 In a previous post, we covered our tour of the Mezcal Real Minero agave nursery. Immediately following that tour, we took our van up the road to see the palenque. We had been standing in the sun for hours so the air conditioning in the vehicle felt refreshing. As we guzzled water bottles, our van crossed a bridge over a dry creek bed. It was early-afternoon in May and the creek would be full once the rainy season began in a few weeks. Along with Jonny, myself, and our friend Chris, we were joined by Graciela Angeles, general manager of Mezcal Real Minero, and William Scanlan of Heavy Metl Premium Imports. In a matter of minutes, we arrived and were once again standing outside in the heat. 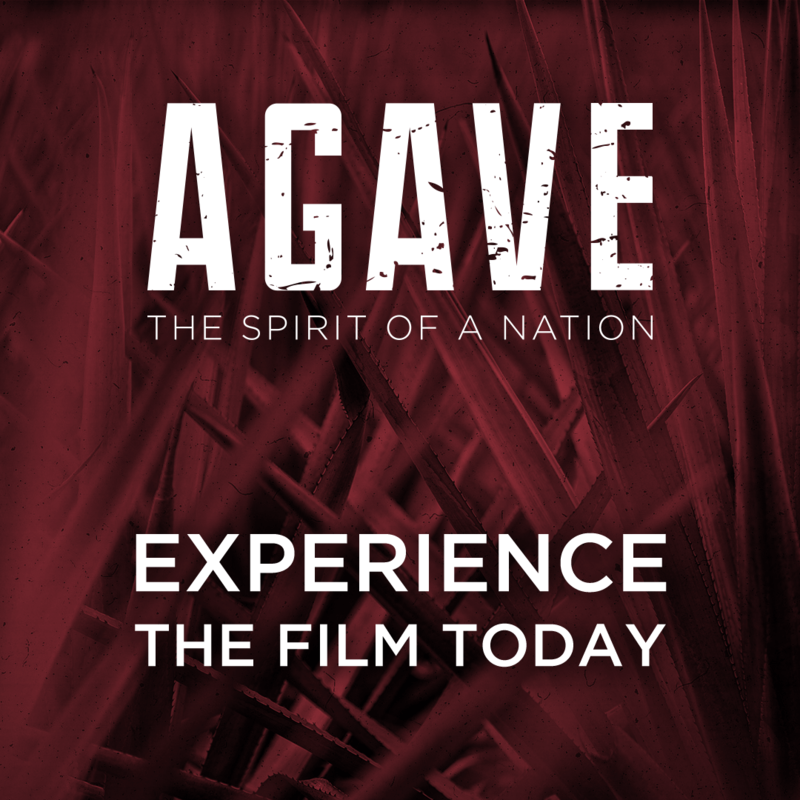 As we stepped through the large metal gates, the smell of roasted agave dominated our senses. We walked down towards the earthen oven (horno) and could see that it had been used recently. This area was open-air but covered by a large metal roof. The palenque was well-shaded and next to a stream. A large mound of halved Agave Espadin pinas were resting on wood pallets near the horno. In front of us, full stalks of Agave Barril were stacked in a row. These cooked agaves will rest for up to 7 days before being mashed. As we walked around the horno, Graciela appeared with a machete half her size. It looked heavy and the blade curved outwards at the end. She chopped lightly at a cooked espadin pina. The weight of the blade cut through the agave like butter; she began cutting up little pieces and handed them to us. At Real Minero, each pina will be inspected by their mezcalero before being milled to ensure it was cooked properly and has the right flavors. Pinas that didn’t meet their standards would not be used. The cooked agave had stringy fibers full of syrupy sugars much like sugarcane. Next, we chewed on some agave barril which tasted like sweet potatoes. It was amazing how much sugar was packed into these large pinas. Next, we walked over to the fermentation area which was steps away from the horno. The production line at the palenque was designed in a linear fashion, which helps with efficiency. The tour took a brief pause as we washed off our our hands which were sticky from the agave snack. This part of the palenque was open-air with a roof and then walls on three sides. The entire palenque was noticeably clean.“This is how a palenque looks when a woman is in charge”, said Graciela in Spanish with a smile. There were no extraneous items lying around, only the few tools needed to move and mix agave mash in and out of the tanks, all neatly lined against the wall. Graciela appeared again, this time lugging a large wooden mallet instead of a machete. She stood over a rectangular pit sunken into the cement. She explained that traditionally, Mezcal Real Minero crushed their cooked agaves with these large bats in the motion of churning butter. The process could take many days for a single batch. Over the years, she took notice of the hip and back problems among palenque workers in Minas which could be attributed to this type of hard work. In an effort to reduce these health issues, she made a change. Most of Real Minero’s current releases are made from agave mashed with a shredder, however certain batches of Mezcal Real Minero will still be hand-milled. We turned to the nearby machine which was the only part of the entire mezcal-making process that required a power source. It looked like a small wood chipper and would save time and hopefully the backs of their team. Among the tools made of wood, stone, and clay… this shredder was the only equipment that wouldn’t be found in a 19th century palenque. On the white wall nearby, their logo was painted in black along with the text “Porque sólo lo Auténtico perdura…” which roughly translates to “Because only the Authentic lasts…” Certain mezcal purists reading this will find the irony here. Some will say that yeasts like the non-uniformity in the agave fibers which occur from milling by hand or by a tahona; and as a result, the fermentation will be more complete and the mezcal will have richer flavors. To be fair, their little shredder is a far cry from the agave-shredding behemoths used by Big Tequila. I doubt this little machine produces perfectly uniform bits of agave. 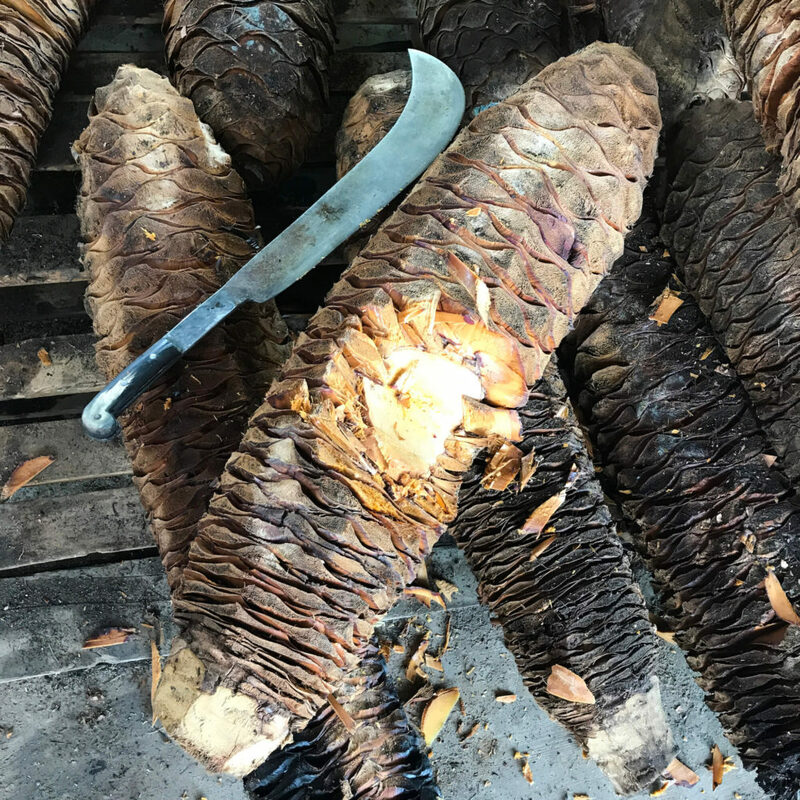 From what I could see, preparing the agave for fermentation still requires back-breaking work… however it now last hours instead of days. Once the agave fibers are separated, they are put into the fermentation tanks. All six tanks were full on the day of our visit. Placing a hand on the outside of a tank, you could feel the warmth from the fermentation process. Believe it or not, you can hear a faint bubbling sound when placing your ear above the top layer of mash. Small flies were buzzing around the vats. The top layer of mash formed a crust, shielding the rest of the fermenting agave mash from insects. Graciela stuck a hollowed-out bamboo stick down into the tank and pull it back up, covered with liquid. There was a slot on the side of the stick that we could sip from. This was mash that had been fermented and water had been added. The liquid we sipped was fermenting Agave Arroqueno and tasted bittersweet. The mezcalero and his team check the fermentation progress often and taste the liquid in the vats. Once the mezcalero decides it’s ready, the mash and liquid mix is loaded into wheelbarrows and brought down to the nearby distilling area. The distilling area consisted of about ten clay pots, built into the ground with brick and cement in a half-circle. This arrangement helped them do an entire run more quickly because they could have multiple stills going at the same time. And if a clay still cracked, they could quickly move to another one. Graciela said they would be rebuilding some of the stills later in the month. 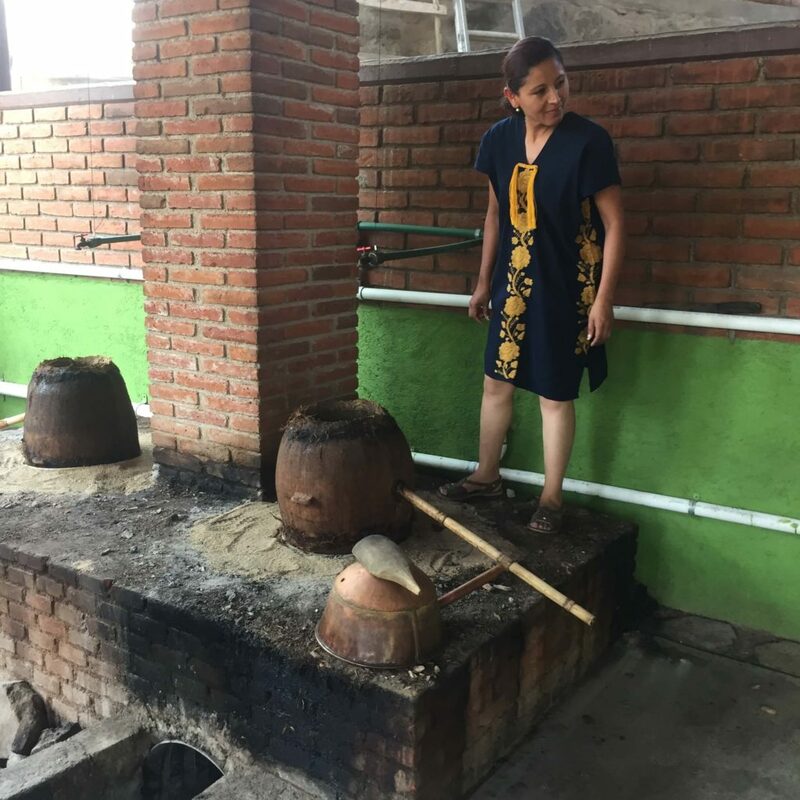 She lifted off one of the tops of the pots and explained how the chicken breast was hung inside the still for their mezcal pechuga (“breast” in Spanish). This was a limited release made with ingredients from the region. When Graciela was a child, she would buy the ingredients for her father from the local market. Her father, the late mezcalero Don Lorenzo Angeles, had considered the pechuga his favorite mezcal. Graciela knew the ingredients to the pechuga but not the exact proportions. 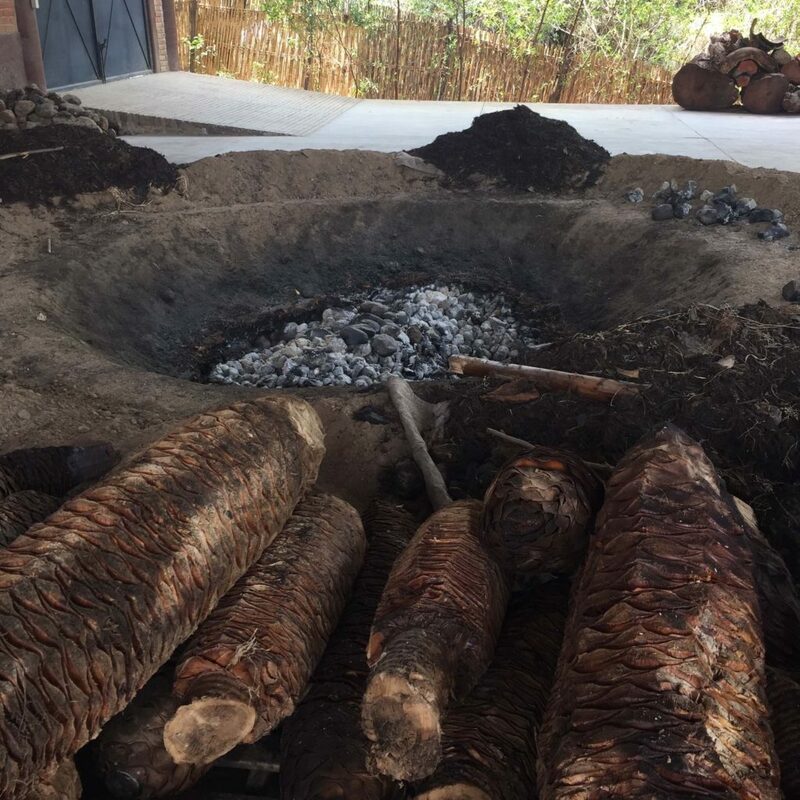 In fact, many people in Minas know the mezcal pechuga recipe because it is a shared recipe in the region referred to as Gusto Histórico, or “historic taste”. That said, the mezcalero must be careful to use the right amount of the ingredients and as with all good mezcal, effectively blend the heads, hearts, and tails to produce a balanced spirit. Up to this point our group had spent the entire day with Graciela and a few members of the Real Minero team, but none of them were mezcaleros. Who is making the mezcal these days? Graciela’s father Don Lorenzo Angeles Mendoza passed away in late 2016 and left a behind a legacy as a father, community member, and mezcalero. Remember, the Angeles family has been making mezcal as far back as their family records go. If history is any clue, someone will be there to continue the legacy. You may have seen the name Eduardo Angeles Carreno next to Don Lorenzo’s name on the back of certain Real Minero bottles. Well, he is not the current mezcalero. We did not enquire about Eduardo’s absence and cannot speculate on it. He still makes mezcal, just not for Real Minero. As the tour of the palenque ended we snapped a group photo in front of one of the clay pots; it was mid-afternoon and we were ready to sit down for a minute. “So, are you ready to try some mezcal?”, asked Graciela. The group lit up and half of us said “si” at the same time. We followed Graciela into a large room with thick stone walls, steps away from the distillation area. Large glass containers that probably held 25 liters each lined the walls of the room. A third of them were full of Real Minero Espadin produced way back in 2008. We gathered around one of the tables near the back of the room and took off our hats, what a day it had been! In front of us were small (and currently empty) jicaras that sat on a ring of woven fibers that kept it upright. Within moments of settling into our chairs, a man in a baseball cap entered the room with a family-sized jicara and a metal funnel. He held the empty jicara in front of us and took his thumb off the bottom of the funnel. Mezcal rushed down into the jicara and formed perlas (bubbles) the slowly spread out and disappeared. Mezcaleros can judge the ABV of a mezcal based on the size and numbers of perlas that appear. He poured the mezcal from the jicara back into the top of the funnel and repeated the process. This time, when the funnel was empty and jicara was full, he handed it to us to try. “Largo”, he said, and held out the jicara. Graciela told us that Largo was her favorite of the Real Minero mezcals. I felt the same way but had never tried this one; it wasn’t in a bottle so we didn’t know anything about it. As the large jicara was passed around the table, everyone that had taken a sip had a look of zen on their face… it was as if the entire day was leading up to this one moment of mezcal-sipping bliss. When it was my turn I inhaled the aromas through my nose and took a small sip to warm up my palate. After that I had what could be considered a small gulp… this mezcal was incredible. It shared many of the amazing characteristics of Batch #2 (a prized bottle I had back at home) but there was another dimension of flavors that gave this mezcal a “freshness”. Were the heightened sensations from vacationing in Oaxaca distorting my palate? Maybe it was my proximity to the still from which it was likely produced? Possibly, but we’d been tasting amazing mezcal since landing in Mexico a few days prior and this was a stand-out. Everyone at the table agreed it was incredible. “You like it?”, the man asked in Spanish. Then we realized, this was the mezcalero. Edgar Angeles and his siblings had grown up helping their father, Don Lorenzo, make mezcal and become familiar with the family business. When Edgar got older he left to study architecture. Edgar had been working as an architect when his father’s health issues began to worsen. Graciela was managing most of the business, but the mezcal making was the work of Don Lorenzo. After his passing, Edgar stepped into large shoes to become the next-generation mezcalero of Mezcal Real Minero. Edgar, like his father before him, will continue the family legacy. It’s interesting to take note that the Angeles family is intrinsically involved and linked to mezcal, it’s a way of life for them because it’s what their family has been doing for generations. Because of this, it’s not at all surprising that Edgar’s mezcal lives up to the early definition of the term Minero, it’s quite an agreeable mezcal. Mezcal Real Minero ages some of their mezcal in glass before bottling and exporting so expect to see some of Edgar’s mezcals reach the market in 2018. We had the opportunity to try his Largo, Cuishe, and Tripon. All were weeks off the still and absolutely amazing. I was begging to bring some Tripon home but they had none bottled for sale. As we passed the large jicara around the table, Edgar was in and out of the room, sharing some of this mezcal and then going back to work. He was still tweaking the recipes of these new mezcals and was eager to hear feedback. As we moved on to taste bottled mezcal from Don Lorenzo, Edgar disappeared back to work. One of the stand-outs was Real Minero Tobala from 2010. Yet, by the end of the day, we agreed that the Largo from Edgar was the highlight. We’ll be first in line to get a bottle (or three) when they hit the shelves. Read about our Mezcal Real Minero agave nursery tour. ?Que es el razon poner la pechuga de gallina en la tinaja? Gracias. Does anyone know Why Don Lorenzo’s son (and Graciela and Edgar’s brother), Eduardo, left the “ family business” to start his own Lalocura label? 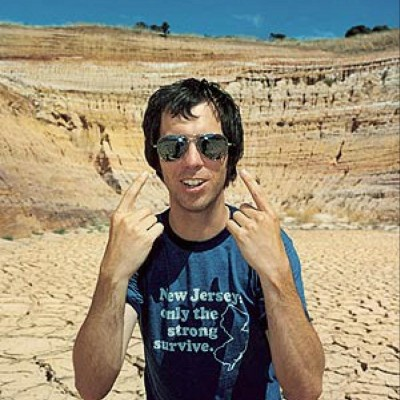 Hey Brian! That’s a really good question. Eduardo was briefly mentioned during our visit. It seemed that there was some tension there, but hard to gauge if the tension was genuine or more in jest. Both Lalocura and Real Minero are making the best stuff in Santa Catarina Minas. That family is amazing. Your site continues to grow and is a definitive resource for education. Adding the journalistic dimension is impressive. Good work, bad hombres. Mark, thank you for the feedback. Glad you are enjoying the blog posts. 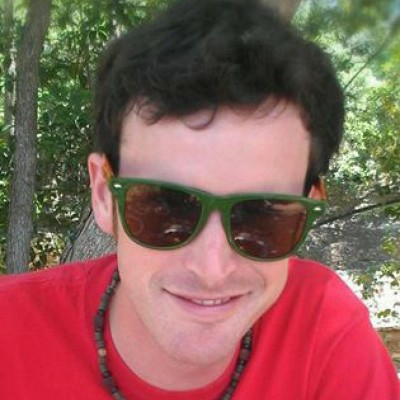 We have a few more Oaxaca-related blogs in the pipeline. Once we run out we’ll have to schedule another trip! Thanks Keith! I enjoy writing these blogs as much as I enjoy reading your reviews. Thanks for sharing them!